To create Desktop shortcuts in Ubuntu,gnome-panel package is required first. Open Terminal. 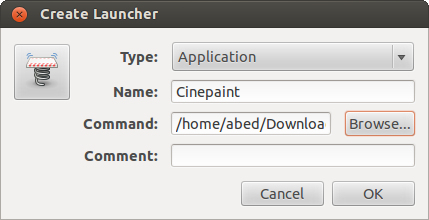 To open terminal click the Dash home from Unity launcher. And type terminal in the search field. And click Terminal. Now check your desktop for the shortcut. If you want your shortcut to appear in the Unity launcher panel (the pop-out one on the left), you can drag it there from the desktop.